Speaking at the High Level panel discussion on Maritime Security on the opening day of the leadership “Our Oceans Conference” in Malta this week, President Danny Faure delivered a poignant message to world leaders, entrepreneurs, civil society leaders, scientists and researchers on the importance of having resilient blue economies and to finding innovative and visionary solutions on how to conserve and sustainably use our Ocean, for the present and future generations. 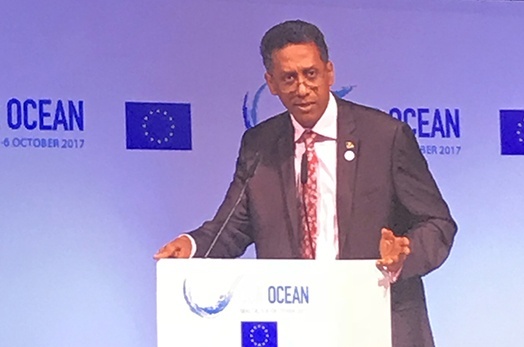 Since 2014, Our Ocean conferences, have invited world leaders to look forward and respond by delivering high-level commitments and transforming the challenges into opportunities for cooperation, innovation and entrepreneurship. The 2017 edition “An Ocean for Life” aims to drive forward new collaborations in the following ocean areas– marine protected areas, sustainable fisheries, marine pollution, climate-change, and this year’s 2 extra themes, maritime security and sustainable blue economy. President Faure was invited to share the Seychelles experience on these themes and also provide an update on the previously registered commitments made in 2016. The commitments were on the issuance of the first Blue Bonds in support of sustainable fisheries, and the debt swap to develop a marine spatial plan of our EEZ and designate 30% as marine protected areas. The conference welcomed participants from around the globe to reaffirm many of the voluntary commitments made at recent UN conference in support to the implementation of Sustainable Development Goal 14 held in June this year.